Just how big is a photon? 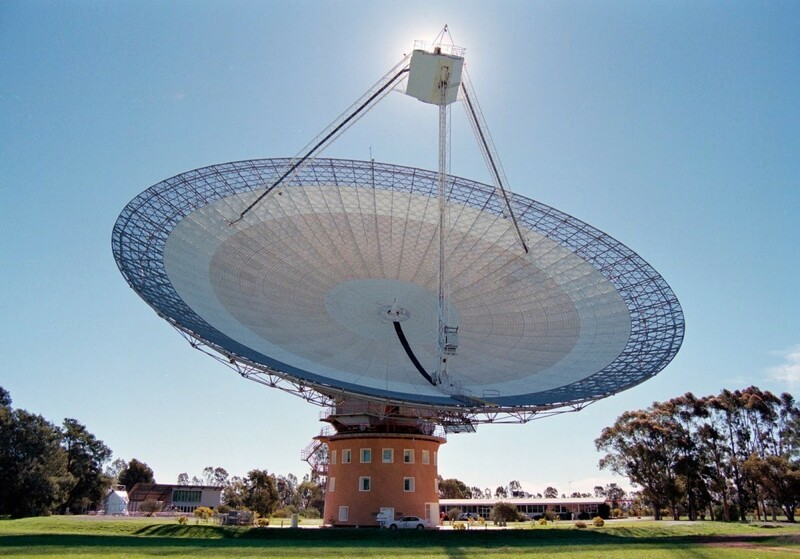 Large radio telescopes are not solid dishes, but rather an open mesh. This is largely done to save on weight, since the dish doesn’t need to be solid to reflect radio waves. You see a similar thing on a microwave, where the door is covered with an open mesh so you can watch what’s cooking. The mesh blocks microwaves from reaching you, but not visible light. But how is that possible? Aren’t photons supposed to be point particles? Radio, microwaves are light, so how does a mesh prevent their photons from passing through it? The short answer is it’s complicated. Although photons are often referred to as particles, they aren’t particles in the traditional sense. They are light quanta, which have both particle and wave properties. Depending on the situation, sometimes the particle aspect is useful, and sometimes the wave aspect is. While photons don’t have a physical diameter, and can be treated as point particles, their quantum behavior gives them a probabilistic size. As a photon gets closer to another object, the chance of it interacting becomes greater. This is often represented as a cross section given in terms of area. You could say the cross sectional area represents the “size” of a photon, but the problem with this is that a photon’s cross section varies depending on what it is interacting with. Photons interact pretty strongly with electrons, and have a relatively large cross section, but with neutrons the interaction is smaller. Under this definition there is no absolute “size” to a photon. The cross section also depends upon the energy of the photon and things like its polarization. There are also different cross sections for absorption vs scattering. Despite all this complexity, there is a basic way to talk about the effective “size” of a photon, and that is through it’s wavelength. Very roughly, the interaction range of a photon scales with its wavelength, so light of longer wavelength is more likely to interact with a conductive material than light of a shorter wavelength. In this way you could say the “size” of photon is basically the width of its wavelength. The wavelength of green light is about 500 nanometers, or two thousandths of a millimeter. The typical wavelength of a microwave oven is about 12 centimeters, which is larger than a baseball. It’s a bit odd to think of a microwave photon as being larger than a baseball, but it is a simple way to explain how mesh reflectors work. The “size” of microwave and radio wave photons is simply too large to fit through the mesh, and so are reflected. Visible light is much smaller, so it easily passes through the mesh. It’s important not to take this model too literally, but it’s good enough for rough estimates. Yup. Still don’t get it. Thanks for trying, anyway. LOL – Ditto, never “understood” the quantum world !! think of a wave with this property: if ANY part of the wave hits a barrier, it will reflect. some things are barriers, some aren’t. you can even, if it’s easier, imagine it is physical. a string, for instance. now, look at the mesh in a microwave screen. a wave, or string, 2 thousandths of a millimeter can easily pass through the holes without any part hitting either side. a 12 centimeter string cannot. as the article says, this is actually not “correct” in the classical sense, but it does explain the action adequately for basic understanding. That’s the way I’ve always thought of it. Nice to know that I was on the right track! if by “wavelength” we refer to the distance between valley and valley on a light wave, then how about amplitude, the height of each valley and hill in the wave? How does the amplitude varies in light, and what effects does it has? So….. It takes a HIT of a photon ON an electron…to start the process, multiplied by trillions. Now… back to the mesh of the radio antenna. People often think that the WAVELENGTH is “larger” than the mesh, thereby “trapping” the radio signal. No. If the solid portion of the radio antenna is, say, 11% of the total area (the rest being air..), then the circuitry after the antenna utilizes only 11% of the photons ! Then the process goes on just like the description above of your car radio. The photons that do NOT hit the solid portion of the mesh simply fly by. Now…is that the ONLY explanation? No…if you read the above article, you will learn that, at this level and size of particle, both WAVE and PARTICLE aspects are present. I am sure the math would work out just as well if we emphasized the WAVE nature of photons. One last comment. We have image sensors for telescopes and cameras that can measure the impact of ONE photon! What do we measure?? We measure the IMPACT of the photon; the amount of energy it carries…(it is hard to imagine ONE bundle of energy actually possessing a wavelength) Now imagine TRILLIONS of photons all carrying the exact energy level. Hitting a piece of conducting metal, they will set up a movement of oscillating electrons, rushing through the circuitry. The most meaningful measurement of this oscillation….is a measurement of WAVELENGTH/FREQUENCY. light does not have an amplitude. or rather, it’s always the exact same amplitude. the only way to change the amount of energy in light is to change its frequency, or change how much of it there is. so when people say light has an amplitude, it’s really just a matter of how many photons there are. more photons will make it brighter, seeming like a larger amplitude, but it’s just a lot of light at the same regular amplitude. The font chosen on this blog means that quotes look like 9s and 6s, please change it! It’s doing my nut in. Otherwise, great write-up. Ta. I see double quotes, not sixes or nines. It may be the font chosen in your browser that has assigned the wrong characters to the code. ASCI fonts should work. Unicode should also work if the characters in your font have been correctly assigned. Great writeup. Not an easy concept and I’m not sure the idea is cemented in my mind’s eye yet, but still very helpful. “…500 nanometers, or two thousandths of a millimeter.” Should be reworded as “…500 nanometers, or one two-thousandth of a millimeter.” The way you have it stated it means 2000 nanometers. What you are trying to say is that (500nm X 2000 = 1mm) or (1/2000mm = 500nm) and instead you said that (2 X 1/1000mm = 500nm). 500 is not equal to 2000.
um, actually, it would be five ten-thousandths of a millimeter. An interesting article in Nature Photonics: “Hologram of a single photon”. +1 Was about to say the same thing! is our reality a simulation? I think it is. For instance, why does light have a max speed? Well, what if light moves 1 frame for each cycle of frame speed! Using D=RT and a frame is a Planck width a rate can be found. So then, what is TIME? It is the pressure we feel by this enormously preposterously fast recreation rate. 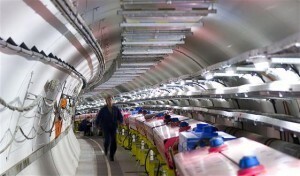 Time Dilation then must be caused by the ‘catching up’ to that whatever (Higgs Field?) that turns the atoms on and off such that we peel away holographic layers from the recreated reality until at C, time stops. Best wishes and go to my website for kids in hospitals ???? We want more kids well faster! I’m not a big fan of the simulation idea, largely because it seems unprovable. What is the difference between ‘WHITE SUN LIGHT’ and ‘WHITE LED LIGHT’ ? Explain. I’ll write a post on this soon. This doesn’t explain what the resolution limit is for an optical microscope, or why electron microscopes can surpass that limit. Those are what I was wondering. Wave length is in the same direction of the movement of the wave. Size of the microwave mesh opening is in the transverse direction. How come a wavelength be the barrier to go through an opening in a transverse direction? A very interesting subject, when an object is and reflect color green iluminated with white light, the electrons in the object will reflect only the green part of the white light of the spectrum by going to a lower orbit around the nucleus, since this orbit is shorter the electron loose energy by emiting a green photon into space telling Us that the object is green. Thank you very much, Brian. I have an undergrad degree in electrical and electronic engineering. This has remained an obvious question but never came up in the context of engineering application. Your practical answer is very much appreciated. Similarly, what us the length of a photon? We were introduced to the Schrodinger equation and quantum in physics, I can only infer that the wave packet probability function best defines the length. As well, it seems that the photon does not have a strictly singular wavelength but rather a bandwidth, this being the only way, at least in description, that the pulse shape can be obtained as it is typically depicted. So, this paragraph is really a question. Thank you for this creating this brilliant site! electromagnetic radiation is sort of like a magnetic field. higher frequencies have smaller (more concentrated) fields, so they can pass through smaller openings. 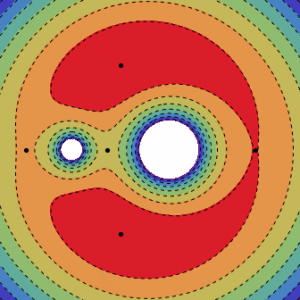 imagine a very strong magnet trying to pass between other magnets… then a weaker magnet trying to pass through the same space. it’d be much easier for the weak magnet. even though nothing ever touches, the fields are repelling them. if you know that higher frequencies actually have more energy, it might seem counter-intuitive that they can pass through smaller openings. but what’s really happening is that the larger weaker wave gets disrupted when its edge gets too close to the mesh. the smaller, more energetic waves, are less affected by it.